On August 23-25, 2010 clusters were damaged by weather conditions that at first seemed to be a typical summer heat spike but turned out to be quite different. 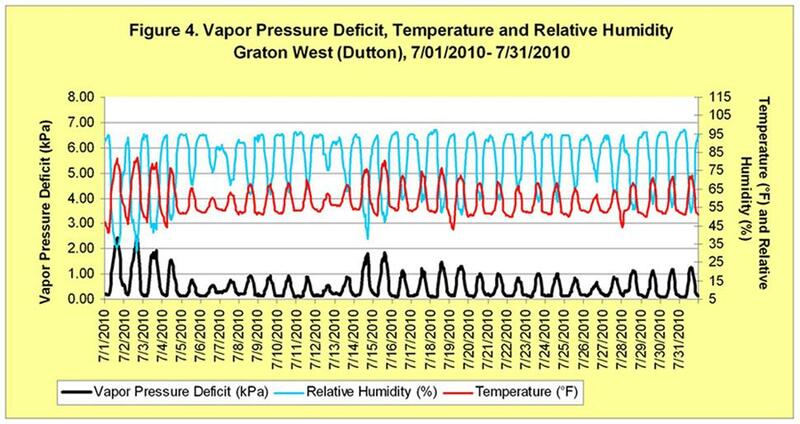 High temperatures coupled with low relative humidity provided conditions that caused more fruit damage then in “normal” heat spikes. Not every vineyard had heat damaged fruit, and in those vineyards that did, sunburn and/or desiccation varied considerably. Fortunately, such weather conditions are rare in the North Coast. There was usually – but not consistently – a clear association of cluster exposure with severity of damage. For most growers, fruit in blocks with north-south rows suffered more damage than in other blocks. In general, clusters exposed to direct light either in late morning or afternoon were partially or completely damaged. Damage on exposed faces of clusters was obvious within 24 hours as berries collapsed and turned off-color. About 10 days later damage to the rachis became apparent in clusters that initially appeared undamaged, at which time pedicles and portions of the rachis were dead. Some exceptions to this scenario were blocks that received ample water because they are in well drained sites or shallow clay soil and managers kept to the normal water application schedule in spite of the cool season. A few growers turned on sprinklers during the warmest periods of the day to initiate evaporative cooling and reduce temperatures inside the vineyard to reduce heat damage. Mild temperatures coupled with dense, wet canopies increased the incidence of powdery mildew and Botrytis infections. As a result, in late July and early August, some growers opened up vine canopies more than usual to allow more light (thus heat) into the fruit zone and reduce disease severity. Beginning August 23 when temperature climbed, many of these exposed clusters were damaged. Affected vineyards were not limited to those with fully exposed clusters as standard leaf removal on the morning sun side of rows results in cluster surfaces with a range of exposures from direct (full) to indirect (diffuse) light. Were clusters acclimated prior to the heat? Clusters are considered acclimated if they are exposed to light sooner than later in the season. Removing leaves shortly after berry set is ideal, and exposing clusters just before veraison should be avoided. In most years, nearly all leaf removal is completed well before berry softening, but greater canopy growth in 2010 presented challenges. Generally cluster acclimation can protect clusters against normal heat spikes throughout the growing season; however for several hours on August 23-25, temperatures exceeded seasonal norms. Berry temperatures are generally warmer than leaf temperatures, and when ambient temperatures exceed 104°F clusters in direct sunlight for more than 2 to 3 hours will likely experience sunburn even if vines are well irrigated (Larry Williams, personal communication). Several factors affect berry surface temperature, most importantly wind velocity, solar radiation at the berry surface, and cluster compactness. The surface temperature of fully exposed berries can be more than 18°F greater than ambient under typical mid-summer conditions and some researchers report greater differences. Maximum air temperatures recorded August 24 by all weather stations operated by Western Weather Group (WWG) in Sonoma County ranged from 105° to 114°F. In summer, vines must remove some of the heat energy they receive from incidence solar radiation. Physical processes allowing vines to remove heat are affected by vine water status and air movement inside the canopy (which affects the extremely small “boundary layer” at the leaf and berry surfaces). Heat energy is lost from leaves by transpiration which results in evaporative cooling. In transpiration, water passes from the leaf blade through stomates located on the underside of leaves then through the boundary layer just prior to evaporation. Berries have far fewer stomates than leaf blades, and by veraison stomates have lignified and are not functioning. As maturing berries do not regularly transpire to remove heat, most of the heat absorbed by berries is removed through convection by air movement (Mullins et al. 1992). Compared to leaf blades, minimal water is transpired by clusters especially after veraison, thus in general cluster water loss plays a relatively small role in total vine water use. Regardless of the small effect water loss from ripening fruit has on the entire vine, water loss from clusters can have significant impacts on fruit weight. 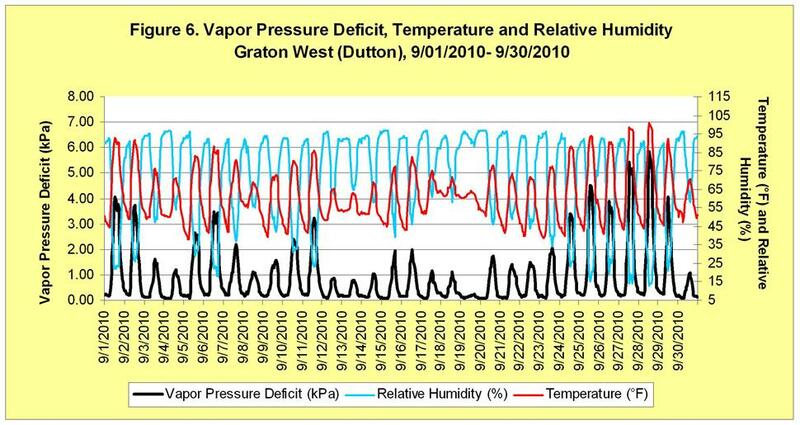 Cluster transpiration is affected by both differences in vapor pressure (water vapor concentration) and temperature between the cluster and the air. 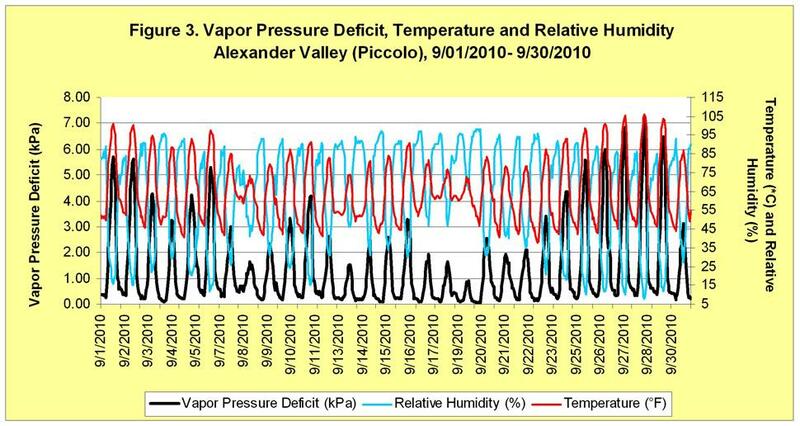 On August 23 to 25, low relative humidity coupled with high temperatures created a vapor pressure difference between fruit and air to levels rarely experienced in California coastal winegrape-growing regions. Berries exposed to direct light would have had much higher temperatures at times during those dates, further contributing to higher than normal transpiration rates in exposed berries causing berry and rachis desiccation. 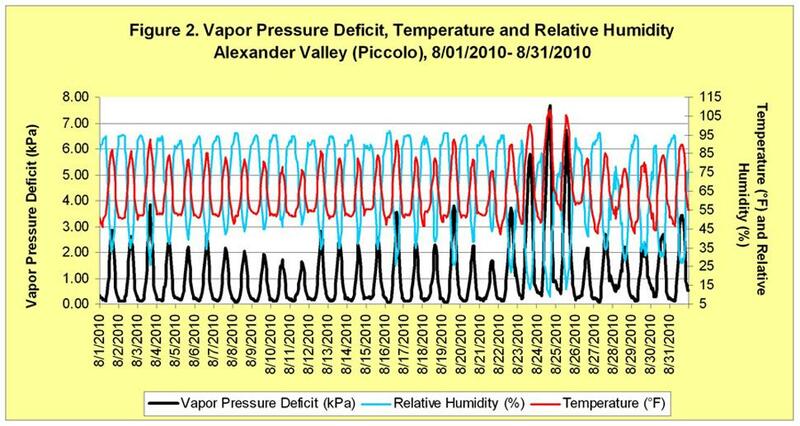 High temperature was not the only issue in August; the vapor pressure deficit reached abnormally high values on one or more dates in August. 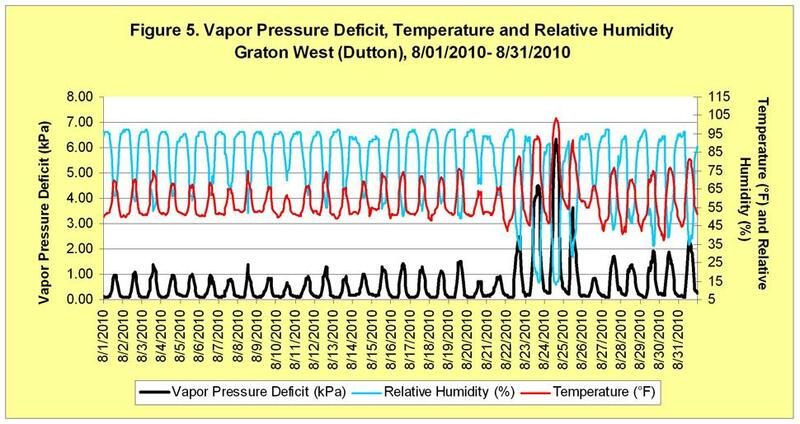 Vapor pressure deficit (VPD) is defined as the difference between how much water vapor is in the air and the amount of water vapor the air can hold at saturation at a given temperature. VPD is a function of relative humidity and temperature and is measured in kilopascals (kPa). A high VPD occurs when high temperature and low relative humidity occur at the same time. Figures 1-6 show hourly temperature and relative humidity data recorded at two WWG stations and VPD calculated from those data. Daily maximum VPD values calculated from the most recent 20 years of data recorded by the CIMIS weather station in Windsor indicate a VPD greater than 6 kPa occurred on just 16 dates. That calculation assumed the maximum temperature occurred at the same time as the lowest relative humidity on each date. Since that was not likely to occur on all 16 dates, it is safe to say that a VPD over 6 kPa is very rare in Windsor. In the Central San Joaquin Valley, daily maximum VPD values can reach 7 kPa but that is also rare. Weekly VPD measurements we took in 2009 between 1 and 3 pm from late July through October in an Alexander Valley vineyard ranged from 1.94 to 4.36 kPa. We didn’t make those measurements in 2010; however, the new WWG station in Alexander Valley, just a few miles from our 2009 vineyard site, records data every 15 minutes and calculates hourly VPD. VPD on the same dates and hours in 2010 as we measured the previous year ranged from 0.92 and 6.47 kPa. On August 24, 2010, the maximum VPD soared to 7.69 kPa (Figure 2). That day in Graton, maximum VPD was 6.34 kPa (Figure 5). As a point of reference, that day in Parlier (about 20 miles SE of Fresno) maximum VPD was 6.59 kPa (calculated from CIMIS weather station data in the manner previously described). How is leaf water potential affected by VPD? At some point during summer, available soil moisture from previous winter rains is significantly depleted and shoot tip growth slows; this is about the time many growers start to apply water. The amount of water growers choose to apply from that point to harvest will affect the degree of vine water stress. 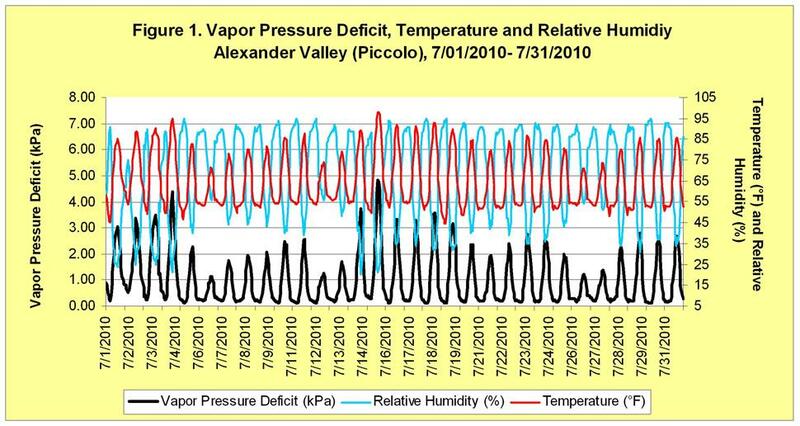 If a high VPD event occurs, it will usually happen in summer when soil moisture levels have been purposely depleted. Some growers measure leaf water potential (LWP) weekly during the growing season to monitor the stress in vines over the season and to assist them in making water application decisions. A few people I spoke with noted that LWP measurements made during the heat spell were not much different than the week prior. Researchers have shown that soil moisture availability of deficit irrigated or dry-farmed vines has a stronger effect on LWP than does VPD. Reduced water in the soil profile causes leaf stomata to become smaller which reduces conductance and transpiration. In studies, LWP of moderately stressed vines (LWP less than -12 bars) did not change significantly over a wide range of VPD conditions (Williams and Baeza, 2007, AJEV 58:173). On very hot, dry days in mid-summer, vines under moderate (or greater) water stress or unirrigated vines will not transpire at significantly greater rates than they would under milder conditions; therefore, they will not lose significantly more water then during “normal” summer days. On the other hand, clusters can lose a significant amount of water by transpiration in those conditions as compared to “normal” summer days, and depending on severity, sunburn or worse may result. Cluster exposure and thus berry temperature is affected by several factors including row orientation, trellis design, water management, leaf removal and sprinkler cooling. If sunburn is a common problem in a block, then the objective is to reduce direct solar radiation on fruit and to have adequate soil moisture when it is needed. That is easier said than done; however what follows are some things to consider. Row orientation: This is often determined by several factors including shape and size of the area available for planting, configuration of adjacent blocks, slope, wind direction, land use of adjoining parcels, etc. N-S rows have the most canopy exposure and E-W the least. Practical considerations and logistics usually have the strongest impact on vineyard design; however, the correct row orientation can reduce the risk of sunburn and heat damage especially in warm, low vigor sites. Trellis design: A vertically shoot positioned (VSP) trellis is the most common type used in the north coast and is ideal for low to moderate vigor sites because row spacing can be narrow. If row orientation results in excessive cluster exposure, some growers have added cross arms to widen the canopy or modified shoot orientation on the afternoon sun side of the row to allow foliage to better cover clusters. Such adjustments are limited because of the need for tractor space between already narrow rows. If N-S rows are the only option, do not use a VSP; cross arms will be essential to provide fruit shading. Water management: Controlling canopy growth by regulating water to achieve yield and quality goals is fundamental to winegrape production. If sunburn and or heat damage regularly causes crop loss, then working to better understand water relations for canopy management purposes in those blocks can benefit fruit quality. Regularly monitoring both soil and vine water status will allow you to see the affect of applied water and soil water disappearance on your specific objectives for shoot growth, berry size and ripening. Knowing the relative amount of water vines can extract in high evaporative demand conditions and how quickly that moisture can disappear will allow you to apply the right amount at the right time to minimize vine stress. Applying water each day of a heat spell will not reduce vine stress if soil moisture content was too low before you started. Leaf removal: In a region with high winter rains, controlling early season vine growth is accomplished by withholding irrigation until shoot growth slows, and by utilizing cover crops to deplete stored soil moisture. Shoot thinning is required to maintain desirable spur positions and manage crop load. In most sites, those practices alone do not result in the desired level of fruit exposure; however in low vigor sites they may. The quantity and quality of light on clusters as well as the timing of exposure has significant effects on fruit composition. The goal is to create a light environment in the canopy that achieves fruit quality targets yet avoids excessive heating of clusters. If a site frequently experiences sunburn or heat damage, then the severity of leaf removal must be reduced to improve quality. In cool, foggy regions, leaf removal is essential for disease control and for fruit exposure, as dense canopies are common due to high soil moisture. Because hot periods are more infrequent than in warmer regions but not absent, determining optimal cluster exposure is more challenging in these regions. Sprinkler cooling: Utilizing sprinklers for evaporative cooling is an option for some growers. When weather forecasts predict consecutive days of expected high ambient temperatures around 100°F or more, sprinklers – either traditional impact or targeted systems - can be used to achieve evaporative cooling. Most research with over-plant sprinklers to achieve cooling has been conducted with impact sprinklers which provide total floor coverage, although over plant targeted sprinklers and under or over plant microsprinklers, misters, etc. have also been used to provide cooling with reduced water use. Temperature sensors inside “protected” blocks allows determination of when temperatures stabilize after turning on sprinklers and helps growers meet water conservation goals. The sprinkler irrigation time required to cool a vineyard may be surprisingly short, at which point, there is no further temperature drop by maintaining overhead cooling. After the system is turned off, the cooling effect will continue as water evaporates off vine surfaces, and can be measured by temperature sensors in the block. Mullins, M.G., A. Bouquet, and L.E. Williams. 1992. Biology of the Grapevine. Cambridge University Press, Cambridge, UK. Williams, L.E., and P. Baeza. 2007. Relationships among ambient temperature and vapor pressure deficit and stem and leaf water potentials of fully irrigated, field-grown grapevines. Am. J. Enol. Vitic. 58:173-181.